The US Department of Labor reveals that in 1970, 22.1 percent of women in the civilian labor force had either attended some college or graduated with a degree. By 2010, that figure had increased over three-fold to 66.7 percent of women in the labor force. 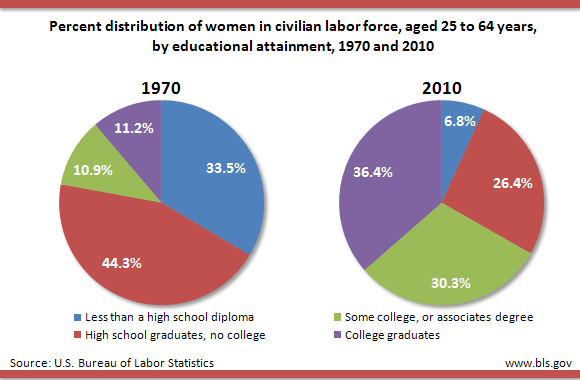 The percentage of women in the civilian labor force that had less than a high school diploma decreased from 33.5 percent in 1970 to 6.8 percent in 2010. 1. Due to rounding, the sum of percent distributions does not equal 100. ​2. For data in 1970, educational attainment categories are based on the number of years of school completed (i.e. less than 4 years of high school, 4 years of high school and no college, 1 to 3 years of college, and 4 years or more of college). In the October when they were 23 years old, 23.4 percent of young women held a bachelor's degree (or higher), compared with 14.3 percent of young men. Overall, young women were more likely to have graduated from high school and to have attended college. Once enrolled in college, women were less likely than men to leave college between school years without graduating.